Mr. Davis has made many unilateral decisions like this that changed direction for the County without input or informing the public. I am sure that some developers were in the Loop��. However, Mr. Davis works for the citizens of Oconee County and should look after the county�s best interests. Oconee County’s road system has fallen behind during the last 7 years. Maintenance money has been diverted to Mr. Davis’s pet projects. The biggest mistake was allowing the Experiment Road (GA 53) and Mars Hill Improvement project to fall through the cracks. I understand that Melvin Davis blames the failure of the Mars Hill project on Mayor Luken of Watkinsville. The City objected to how the road was to tie in with existing roads and Main St in Watkinsville. Rather than reach consensus, a unilateral decision was made by Mr. Davis. Wonder if there are Board Minutes on approval of the Oconee Connector Project? 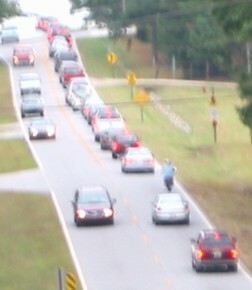 Mars Hill Road was crowded in 2003.What will it be in 5 more years?! In a recent interview, Melvin Davis told an intriguing tale about how he “saved Oconee County $ 7 Million in Right of Way costs” for the Oconee Connector. BULLAH! We had acquired significant parts of that Right of Way before 2001 at a cost of less than $ 20,000! The Mars Hill Road project was to have ROW costs paid by State and Federal funding sources. My understanding is that Mr. Davis, unilaterally, switched the priorities on those two projects. Mars Hill Road is pushed way into the future as traffic jams increase from approved subdivisions. Query:Who got paid $ 6 Million for this short ROW project? Mr. Davis has made many unilateral decisions like this that changed direction for the County without input or informing the public. I am sure that some developers were in the Loop……. However, Mr. Davis works for the citizens of Oconee County and should look after the county’s best interests. Sources have indicated to AVOC that the “big secret project” here was the impetus for pushing alcohol sales in Oconee County. Another example of the County’s Direction being influenced by Melvin Davis’s secret “Wheeling and Dealing”…. Clearing the last hurdle, Oconee County recently finished buying up the last of $ 6 million in right-of-way land………………….. DOT and MACORTS will direct $ 4.5 million more in federal funding to build the new four-lane divided road, bringing its construction budget to $6 million. State transportation officials have put the brakes on future transportation projects around the state, but given a green light to a long-anticipated Oconee County road. In fact, the extension of the Oconee Connector, formerly called Jennings Mill Parkway, will get even more money from the state Department of Transportation as it heads to construction this fall. At the transportation department's request, officials with MACORTS, the regional transportation group led by officials in Madison, Athens-Clarke and Oconee counties, are meeting to increase the Oconee Connector's construction budget at called sessions today and Thursday. DOT and MACORTS will direct $ 4.5 million more in federal funding to build the new four-lane divided road, bringing its construction budget to $ 26 million. Cost estimates for construction, expected to begin in September, must be adjusted to cover higher fuel and material costs, said DOT spokesman David Spear. The 3.1-mile Oconee Connector, linking Epps Bridge Parkway and Georgia Highway 316, would open up a wealth of undeveloped land in a traffic-heavy commercial corridor near the Clarke County line. Oconee County officials have pushed for the project for about a decade and are excited at the prospect to boost the county's commercial tax base, said county commission Chairman Melvin Davis. As he explained to DOT officials recently, Davis thinks the project "will do more for economic development in our county than any other project we can do in the state." State officials also are on board because the road will act as a bypass for the busy Epps Bridge-Ga. 316 intersection, Davis said. At least one large commercial center already is in the works for the Oconee Connector. Developer Frank Bishop's plans for Epps Bridge Center, currently going through a regional impact review by the state Department of Community Affairs, include a movie theater and retail stores on the south side of the new road. A 113-acre tract owned by the family of Varsity founder Frank Gordy also would gain road access after the connector is built. The Oconee Connector is among only a few local projects squeezing into the transportation department's tight budget for 2009. Local and state officials said the road is moving forward because it's ready for construction. ATLANTA - State transportation officials have been sounding the alarm for several weeks that a funding shortfall is threatening future road projects. Now, the state Department of Transportation is warning the driving public that plans to widen roads, rebuild interchanges and improve bridges throughout the state have been delayed. The DOT on Tuesday launched a Web site detailing $ 7.7 billion worth of projects that had been slated to begin construction or study sometime in the next six years, but have been lopped off the department's priority list………………………. - Widening Georgia Highway 53 and Mars Hill Road from Georgia Highway 15 to Georgia Highway 316 and the Oconee Connector; $ 20.7 million construction work originally planned for 2012.